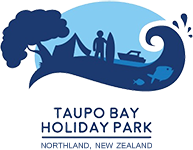 Welcome to this family owned and operated holiday park just 300 metres from the picturesque beach of Taupo Bay. We are a little 'off the beaten track', but you will not be disappointed – this is the real New Zealand. Waves to surf, fish to catch, kayaks to explore the area, and space to relax in our 1.2 hectares of campground which offers plenty of shelter and shade and lots of space for the kids to explore. Enjoy the 1.2 hectares of camp, offering plenty of shelter and shade. We have a self-contained 2 bedroom cabin, kitchen cabins (no ensuite), bunkroom, power and tent sites. We have a fantastic BBQ area where you can enjoy the catch of the day or prepare a meal in our well-equipped and large kitchen. We also have a small seasonal store which has a range of basic supplies. Surf's up – go surfing. No waves – take a kayak out. Walk the beach, or rocks on both ends of the bay; it's great for exploring, fishing or just relaxing. There is diving and snorkelling and nice playgrounds for the kids by the reserve and at the camp. Once you are here you may not want to leave, but if you do it is just twenty minutes drive to historic Mangonui and the beaches of Doubtless Bay. 90 Mile Beach is an hour north or, if travelling to Cape Reinga, it will take a couple of hours from Taupo Bay. Head south and walk the Dukes Nose track at Totara North, or explore other walks around the beautiful Whangaroa harbour taking the scenic road via Tauranga and Matauri Bays to capture more of the area's beauty. Another hour south, you arrive at the Bay of Islands. Book a variety of tours to explore the area with experienced guides in a relaxed way.